Isn’t it terrible that decluttering your life almost seems like the latest fad that people are starting? Honestly, I’m not too into fads, but I think it’s a great one, if that’s what it is! When I met my husband I was Ms.Materialistic, Y’all. I had all the shirts, shoes, purses, scarves, makeup galore, jewelry I never wore, etc. But even outside of that, I had other things! So many pens, pencils, papers I didn’t need anymore, or just general objects that had no meaning whatsoever in my life. Here are a few great things to get rid of to start decluttering your life right now. Hi, my name is Chelsea and I’m a blogger. I love homesteading, homemaking, organizing, farming, gardening (most the time), and I love blogging. What does this have to do with your computer and starting to declutter your life? You wouldn’t believe the amount of pictures, downloads, random files I don’t need, etc. that I had on my computer until the other night! I probably deleted 1,000 various types of files from my computer. Doing this didn’t only feel SO good but my laptop is so much quicker now. Decluttering CAN be mindless and that’s okay! Take advantage of Netflix at this time while ridding yourself of things you don’t need anymore. Full disclaimer, I stole this one straight from Stephanie at Happily Homegrown. I’m part of a wonderful Facebook group she runs and she shared with us the other day that she took the time to declutter her email inboxes. She unsubscribed to emails, deleted emails, organized her inboxes, etc. I did the same thing last night and it felt SO good (almost 1,000 emails in my inbox UNREAD). I started by deleting everything I didn’t need and I plan to slowly unsubscribe to the pages I’m not interested in as the email arrive again. This one might be hard for a lot of us *raises hand*. We have so many subscriptions to things! Hulu, Netflix, Audible, you name it. We use most of them occasionally…okay probably WAY too much. I’m surprised we don’t need a new Roku remote by now. Canceling subscriptions are not only a step to starting to declutter your busy life but it also saves money. CHA-CHING. The only one I’ve unsubscribed to so far is Audible, but I’m working on the rest. None of us are perfect and maybe I like to indulge in Grey’s Anatomy every now and then…no pointing fingers, here, though. This is a #judgementfreezone. I am Queen of the Bookmarked Links. There are bookmarked links in the regular Bookmark section, the “Other Bookmarks” section, the “Bookmarks Bar”, and I also have folders for Blog, Blogging Courses, Homestead Stuff, Simple Homestead Blog Hop, Recipes, Keto Recipes, and Credit Cards. Organized, yes. But there are probably 50 links under most of those categories and that’s a little excessive no matter what way you put it. Every 3-6 months I sort through the links and delete the ones I either have no idea where they came from, haven’t looked at since I saved them, or are now totally irrelevant to my life. It’s always daunting but feels great after I’m done. Post-It notes, pens, pencils, tops to pens, extra erasers, etc. First, before I start preaching, I have to tell you something. My name is Chelsea and I’m a pen hoarder. There, I said it. I love pens and when I find one that I like, I often buy a pack so I never run out! STOP IT THOUGH. I’m not joking, I had 20-30 pens in the car. There are another 30-40 in the house. In each purse of mine, I have probably 2-5 pens. This is just excessive and I’ll be the first to admit that I might have an issue. But I can also tell you this: Getting rid of something as small as a pen can make you feel so accomplished when you’re decluttering your life. Take it from me, Chelsea, the pen hoarder. I’m two years into sewing and GIVE ME ALL THE FABRIC. I have a rule now that if I don’t have at least one project in mind for that fabric, I don’t buy it. I also go through my fabric drawers every couple months and get rid of little bits that I can’t use or fabric that, in reality, was never something I’d use in the first place. Donate it or use the fabric as rags, but just get it out of there. We have 3 backgammon boards in our house and there’s another one at my mother-in-law’s house. Again, excessive. Decluttering your life is about simplifying and minimizing certain things. Having more than 2 backgammon boards max isn’t really needed unless you’re hosting tournaments. The worst thing about it is that they don’t even all have the pieces they need! So, yes, those will be going to donation. I’m regretting making the choice to write this post because self-reflection is real, folks, and there’s a lot of it going on for me right about now. I have SO many CDs. There’s this huge box in the car of local music I’ve acquired over the years from when Emerson and I traveled playing music together. I’m not sure I’ve even unwrapped/opened half the CDs. There’s just this big box that takes up a portion of the floor in the back seat of our car and they’re always there. I’ll be adding it to my list of things to purge. DVDs are easy to get rid of for us because everything is streamed now. We kept a couple of our favorites like Lonesome Dove, Robin Williams: LIVE on Broadway and Rocky Horror Picture Show (#judgementfreezone, remember?). The other ones that were dusty were donated because we never watched them or thought about them. When I mention electronics I mostly mean things like broken phones, earbuds with the earbud part missing, random chords, etc. I always find random phone cases that I really don’t know where they came from. If you have objects like that in good condition, throw them in the donation box, not the trash. Never throw electronics away because they can leach chemicals into the landfills and that’s a big no-no when we’re trying to love the environment a little more. Always donate what you can and properly dispose of what you can’t. Yes, it’s so much easier to just throw it in the trash, I know. You just have to keep in mind that, while you’re trying to declutter your life, you’re also paving the road to a more mindful lifestyle. Red flag! I have so many books. I went through them all last year and narrowed my collection down to one 5 shelf bookcase (and a shelf for my cookbooks and songbooks) and that’s pretty good for me. The important thing is that my husband or I use every one of them. I do acknowledge that it’s just us two right now and when you have more family members, young and grown children, etc. your collection will grow and become harder to minimize. I suggest seeing if you can have a family purge day and have everyone get rid of 3 things at least. This would be a great starting place! Then, go out for ice cream or something because it can be a bit stressful getting other people to just on the “Purge Wagon” to start decluttering your life. Have patience! The bathroom is a room in the house where most of us do just a few things in and that’s it. Because we don’t spend a majority of our time in there, things get pushed to the back of cabinets and drawers and forgotten about. When I went through my bathroom I donated an unreal amount of travel bottles, travel tubes of toothpaste, hair products I hadn’t used in months, hair blow dryers (I had 3….don’t ask), and so much more. You’ll find that, besides toilet paper and towels, you don’t really need multiple of everything in the bathroom. 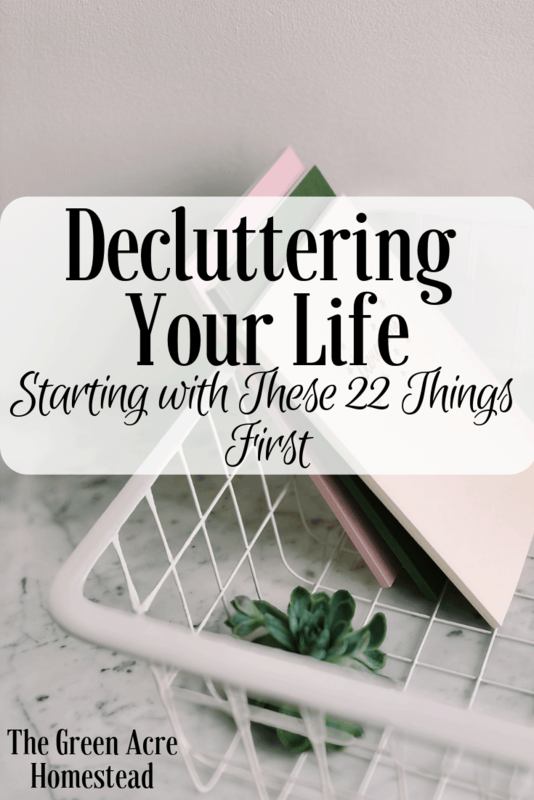 I would almost say that starting in the bathroom would be the easiest place to start when you’re wanting to declutter your life. Ladies, I think you’d be surprised by the amount of makeup we have but don’t need or use. Not to mention, you’re not really supposed to use the same makeup for as long as I was using some of my makeup…EW. I have two tubes of mascara now and 2-3 eye shadow pallets I use every weekend when my hubby and I play music at restaurants, bars, etc. as our side-hustle. I don’t have bags and bags of makeup anymore that I have to search through to find my favorite tube of mascara that I use every time, even though I have 9 tubes. Unfortunately, makeup ends up in the trash. Eventually, I’d like to try and make my own makeup but I’ll first use the stuff I still have. Let me know if you have good recipes I can try for DIY Makeup! Medications are short and sweet, really. Consolidate and discard. If you have two half bottles of ibuprofen, combine them if they’re the same type. BE SURE to properly discard of prescriptions medications. I would suggest calling your local pharmacy and/or sheriff’s office to ask what the rules are in your county. In most counties, the sheriff’s office will have drop-off days for prescription medications. Unless you have a team of people peeling carrots and potatoes for canning (and you very well might, so just skip this one if you do! ), you probably don’t need that many potato peelers. While decluttering my kitchen, there were so many kitchen gadgets, spoons, forks, cups, etc. I never used or even knew were there. 6 wooden spoons were excessive for someone who never used them and while I was at it I gave away those 6 mugs shoved in the cabinet. I might hate clutter in the kitchen the most because I want all the space I can have to create. Probably once a week now I go through one cabinet in the kitchen and try to get rid of things. I LOVE it. Tupperware are like socks, over time you just lose the other matching piece. Just this week I seemed to have misplaced two tops to two of the bottoms of Tupperware and, man, that’s aggravating! If this happens to you, you can sometimes repurpose them! Use them as feed scoops for your animals or, if the Tupperware is small enough, use them in drawers to organize and section certain items. If you can’t repurpose them then recycle them, if you can’t recycle them then you can donate them. I just hate to throw things away! If the Tupperware isn’t useable anymore, then I suppose you should trash it. Decluttering your life feels good but you do unfortunately have to sometimes add to the landfill on your way. This might be one of the hardest areas when it comes to decluttering your life. It’s not hard because you’re attached to the items but because most of us really hate wasting food. I’m far too guilty of it myself and I just hate to admit it. One of my goals for 2019 is to waste less pantry food. Food items that are stored in the fridge are 98% eaten but the pantry just gets pushed further and further back. I have a white board in the kitchen and I’m going to start an “Eat This” list or maybe an “In Stock” list so people know what is there and what needs to be eaten. Magazines…laughable really. I had SO MANY MAGAZINES, and I kid you not, I’ve never looked at a single magazine I gave away, and that’s why I gave them away. There’s a pile a Country Living magazines in my living room I’ve looked through a couple of times. If I’m being honest (and I always am so here we go), I’m keeping them because they look nice *face palm*. Really, they’re colorful and make a great centerpiece for a little table we have in the living room. They’re the next to go, though, because it really is clutter that I don’t need in my life. Through middle school and high school, I kept every single card. Every. Single. Card. When Emerson and I moved to our homestead, I went through all those cards and got rid of a lot of them. Then we got married and the cards came flooding in! This time, there was so much sentimental value behind every card, it was hard to give them away. My older sister gave me the idea to cut the cards in half and use them as recipe cards and that’s what I did! Genius idea, right? I get to keep the cards by repurposing them to write all my favorite recipes on. Win-win. The ones that were blank or had no name on them I threw away or recycled. Such an easy step to decluttering your life! I’d argue to say that our closets might be most of our biggest pain points when it comes to decluttering our lives. For some reason, clothes hold sentimental value. If you’re reading this, you might’ve heard about the new Netflix Series called “Tidy Up with Marie Kondo“. She has a rule with clothes where if it sparks joy, you keep it, and if it doesn’t, you donate it. Here we go with the honesty again, but I thought this was super silly when I first heard it. Then I went to my closet and realized it’s true. Some of my clothes spark joy and others don’t. I also turn all my hangers around the wrong way and correct them as I wear that article of clothing. Every backward hanger at the end of 6-12 months is repurposed or donated. I donated 30 shirts last year! 19. Sheets, Pillow Cases, etc. We have a trunk in our room that houses all of our sheets, pillowcases, etc. Brook McAlary presents the idea in her book “Slow: Simple Living for a Frantic World” to designate a space to an item (or items) and once that space starts to overflow you get rid of some of the extra. Let’s just say I really need to go through my trunk of sheets, pillowcases, etc. and leave it at that. You probably only need 2-3 sets of sheets for each bed in your house. I understand there are circumstances where you would need more than that, but I think it’s a good starting spot for decluttering your life. Do you keep every manual you’ve ever received with every piece of equipment you’ve ever bought in your whole life? Yeah, me too! I don’t even read manuals, Y’all. It’s true. I’m that annoying person who hates reading the manuals and directions and would rather figure it out on my own. Sometimes it works, other nights I end up cursing myself for being such a stubborn dang woman. The funniest part? I still save the manuals! As if I’m going to want to take it apart and do it again. If I ever sell that poorly made bookshelf in the living room, there’s no way I’ve taking it apart first. Get rid of the manuals, especially if you’ve never looked at them. Some manuals you should keep for larger pieces of equipment or if it carries a warranty, but outside of that, do your decluttering mission a solid and lighten your load. This is the longest blog post I’ve ever written and I promise it’s almost over! There’s just so much to say and decluttering your life is one of my favorite topics. “Declutter” your chores and tasks. This doesn’t mean you stop doing the laundry, but maybe you choose a day or two to do the bulk of your laundry. On Sundays, I clean and blog and that’s about it. I’ve made a schedule for myself and keep a white board near my workspace where I have a “Priority” list and a “Not-So-Priority” list. Organizing your life is as important as decluttering your life and they go hand-in-hand. I’ll be writing more about organizing your life and scheduling soon, but until then, decide what HAS to be done and how much of it then move on. Finally, learn to say no. Decluttering doesn’t always mean that you’re getting rid of physical items. Decluttering your life is about slowing down, living intentionally, and reducing stress. If you feel like you’re constantly forgetting about your engagements or stretching yourself thin with the number of favors you do for everyone around you, learn to say no. Learn to set aside time for yourself. Loving yourself is part of this journey, too, and I had to learn that along the way. It doesn’t matter how you do it really, but you have to set aside a few minutes (at least) every day to do something for yourself. For example, every night I moisturize my face and rub the soles of my feet with essential oil while listening to my favorite music. The lavender oil relaxes me, I treat myself to a small foot massage, and I listen to music that I love. This is my time. I take that 5-10 minutes every night to reflect on my day and on myself; to evaluate my progress and make mental notes of what I’ll do tomorrow. “Me” time can be something as small as just standing still for a moment, closing your eyes, and breathing. Anything that makes you stop and remember that living simply isn’t always simple, but it’s always worth it. That’s my motto and I invite you to use it for yourself. Let’s start decluttering our lives, friends. One small thing at a time. Read next about how to start living intentionally today, simply!